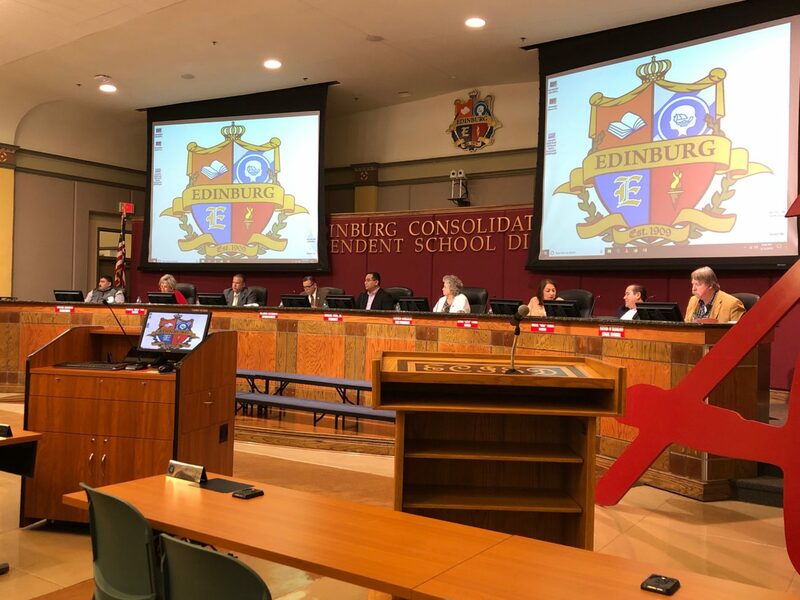 EDINBURG — Voters here will decide whether to pass a $220 million bond issuance in May after school board members approved to order the election with a split vote 4 to 3. The need for a $220,660,000 bond issuance — which would pay for a middle school, high school, two career technology centers, renovations and classroom additions — was debated among the school board trustees on Tuesday. If passed, the school district could raise taxes by up to four cents. Miguel “Mike” Farias, a board trustee who voted against the measure, suggested an election on a smaller bond issuance of $152 million that would not raise taxes to be held in November. In proposing the smaller amount, Farias said he didn’t see the need for a new middle school, citing numbers from a demographic study that projected middle school enrollment dropping below their current capacity. “I don’t see a justification for us to do a middle school considering the numbers that were given to us,” Farias said. Trustee Xavier Salinas disagreed, citing “best practices” recommendations from the Texas Education Agency that suggested 800 to 1,000 students per middle school. Farias’ proposal for the smaller bond option failed with only Trustees Dominga “Minga” Vela and Leticia “Letty” Garcia voting in favor of it. Salinas, along with trustees Carmen Gonzalez, Oscar Salinas, and board president Robert Peña Jr. voted against it. When Peña motioned for the $220 million bond election, the measure passed along the same lines. He noted that middle schools were currently overcrowded with most having over 1,000 students. “My personal reason for going forward with it is the fact that it’s going to alleviate the classroom crowding in these middle schools and high schools,” Peña said. Passage of the bond would allow a tax rate increase of $0.0402 per $100 valuation that would bring the current rate of $1.2398 to $1.28 at its highest. The tax increase would depend on the final cost of the facilities, according to Peña. “When facilities go out for bids and we’ve determined what the final numbers are by the bids, then we can determine what the final usage of the bond will be,” Peña said. When asked why he wanted to hold the bond election in May instead of November as Farias proposed, Peña said he didn’t want voters to be distracted with other elections and be able to focus solely on the bond issue at the polls. Farias, however, reiterated after the meeting that holding off until November would allow more time for constituents to learn about the bond and voice concerns. “Why do we want to rush it in May?” Farias asked, continuing to question the need for a new middle school, citing a ten-year enrollment forecast within the demographic study that was conducted by Templeton Demographics and presented to the school board last month. The forecast projects that total enrollment at their middle schools will fall to 7,256 for the 2019-2020 school year, below the 7,284 capacity, and will continue to drop over time. “I support the bond for the needs that we have in our district, but let’s do it correctly and let’s do it in November to allot enough time for our community to get involved,” Farias said. Correction: The story has been updated to reflect the correct spelling for Trustees Dominga “Minga” Vela.